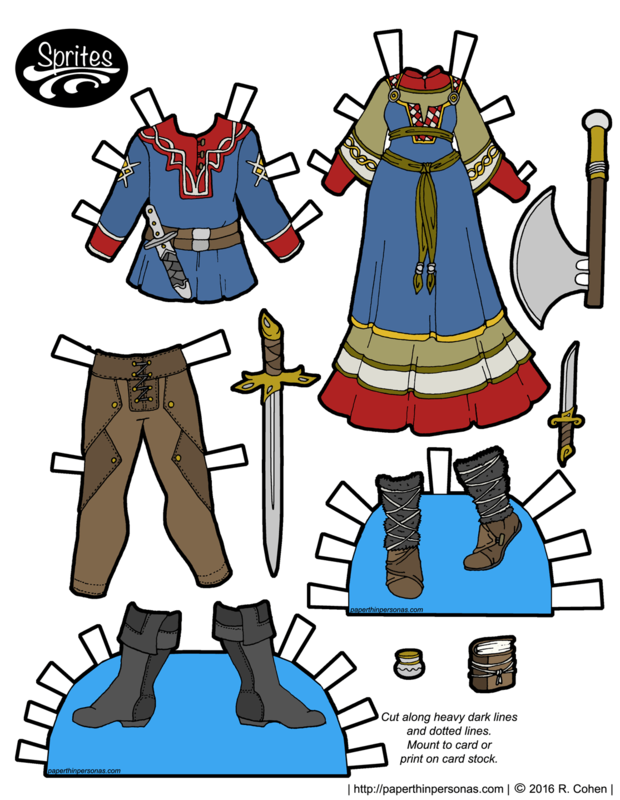 Now, I’ve done a historical viking paper doll before for the B&B paper doll series and I suspect I’ll do one again, but that is not happening today. Today, I decided to play with viking clothing in an entirely fantasy realm. I tend to do my laundry in the evenings. I never seem to remember to start it before I go to work, so I am writing this post to the rhythmic noise of the washer cleaning clothing for tomorrow and the dryer doing the same. The truth is that I designed these outfits so long ago, that I don’t really know what to say about them and listening to my washer is not very inspiring on the blog post writing front. I guess what I’ll say is this: One of the most interesting things about doing the Sprites is getting to think about what to draw for a boy and then what to draw for a girl. That’s also one of the more challenging aspects of the process. These two outfits are really tied together more by their color scheme than by their design motifs. Want to support the blog? Think about becoming a Patron. Looking for a Sprite paper doll to wear these outfits? Pick out a Sprite paper dolls here. These are great! Designing a coordinating set is tougher than it sounds…. i love these! i always get excited when i see you doing cool stuff for your male paper dolls ~ and i love the coordinated outfits (it’s always so “fairy tale” to me). I knew you’d be excited about the new guy stuff.